Okay, so I flew to Tunisia in a fabulous private jet in November for WSIS, and it was really an experience. I had planned to spend 3 days meeting that diverse community and then planned to go on to the next thing (which was some time in Morocco for OSI)...but my body had other plans. Emergency Appendectomy in Tunisia, oh my! Woke up at 3:00am local time and something was seriously wrong, but I thought it might get better. I actually waited until 6:00am before I called the hotel doctor, who turned out to also be the British Embassy doctor. Very nice man. Told me I needed an ambulance and called for one. Then the hotel manager showed up to camp out in my room while we waited for the ambulance (which took a couple of hours). What they don't tell you when you're waiting for the ambulance to come is that its required by law to take you to the nearest public hospital. There you will be seriously frightened. I was carried through a maze of construction (sawing, hammering, paint being applied to walls walls of visquene and open windows...and flies) and then past the "waiting room" where I caught sight from my gurney of lots of people, many with obviously broken limbs or hands pressed against open wounds bleeding on the floor while they silently waited their turn. I was wheeled immediately into an examination space, a curtained-off cubicle against a wall, and followed in by two doctors who called in five or six "student doctors" to assess my situation. They all took turns thumping on my belly (ouch) and then turned around and said, "We'll have to operate!". Lucky for me, one of my colleagues from Intel met us at the public hospital and immediately started arguing on my behalf. I am so grateful to her, because I was just then realizing how ineffective I was to advocate for myself while strapped to a gurney and an IV. Fifteen minutes later I was back in the ambulance and headed to Clinique de la Soukra, a private clinic. It wasn't the one I'd asked to go to (on advice of that British Embassy doctor), but my Intel colleague was pretty sure it was where I wanted to be. The doctors were really patient with me and answered my questions (in French) and instead of just prodding my belly they actually ran tests. MRI, Sonogram, Chest X-Ray and several fluids tests later...they recommended an appendectomy! So, same outcome but at least I felt the diagnosis had been reasonably confirmed. By now I was starting to feel some serious pain, and I had a pretty nasty fever too. I should mention at this point that I have a very high pain threshold. They asked me if it hurt, and I said, "More than when I gave birth at home!". I also had acquired two new Intel helpers. It was my good fortune that there were 80 Intel folks in Tunis for WSIS. One of my colleagues, June, took over the task of speaking with International SOS (the medical insurance firm that covers Intel employees when they travel) and the other one, Ben, helped me speak to the clinic staff. I actually speak French and even a little Maghrebi Arabic picked up during my Peace Corps days in Morocco...but it does take more energy than speaking my native tongue and as I was feeling less and less comfortable it was nice to have these good people looking out for me. Now the question was, "In what country do you want your appendix removed?". I had the option of flying anywhere in Europe, thanks to a good friend who offered me use of his private jet (and the willingness of the British Embassy doctor to fly with me)...but as I say I was getting much more uncomfortable by now and was pretty worried about flying in this condition. Problem was that SOS couldn't decide about approving the level of care I would receive at the Private Clinic. They wanted me in Rome or London. I called a couple of chums in London to ask their opinion. Ben Laurie said he'd sooner do it in London, but Simon Phipps had the good sense to check the International SOS website (which I couldn't do from the private clinic...alas, no Internet :-() and found out that in Tunis a private clinic would probably provide a high level of care. Not sure why the folks on the phone from SOS didn't know this, but it gave us some help deciding. Then we found out that Clinique de la Soukra has some sort of UN Certification. That convinced everyone I had a better chance in Tunis, so the plane went back into the hangar. Now, aside from my husband and Ben and Simon, I'd not called anyone outside of Tunis to let them know what was happening. It was still early in the day in California and I felt like they would just worry and not be able to do anything. My husband had already been up for the whole night discussing options with me...poor man. When I was in the Peace Corps I'd gotten pretty sick at one point and my Mom came to Morocco. She never hesitated, just got on the plane...but I knew it was hard on her. I kept telling myself that appendectomy is a pretty routine proceedure. I'd call her when I woke up and then I'd not be in so much pain and she would be persuaded not to get on a plane. The operation was pretty quick I believe. When I woke up in post-op they showed me the appendix in a bottle, all tagged and ready to go to the lab to be checked for abnormalities. It was green and swollen and about 4 inches long. 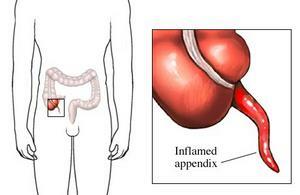 I found out later that "normal" appendix is about an inch long. They told me it would have burst if we'd waited much longer. I woke up again in my room with my colleague June sitting on the sofa using her Blackberry to SMS our boss that I was waking up. For the next day I always had someone from Intel with me. Ben actually tried to sleep in the spare bed in my room (which must have been hard to do since I was forced to sleep on my back and probably snored...and also was forced to call a couple of times for a bedpan because they were running fluids through my IV to make sure my kidneys were still happy). He and June deserve some kind of medal for being so helpful. The operation was done endoscopically, which was pretty slick I thought. Clinique de la Soukra is first an formost a place for plastic surgery, so I have scars that are tiny (three of them, each 5-10mm) and discreet. In contrast my son Adi's traditional appendectomy scar is nearly two inches long and hurt him alot while healing. By the next morning I was ready to get up and walk to the lou on my own two feet. I discovered I liked standing up better than sitting (less folding of the tummy :-) ). I found that Tunisian hospitals don't bother you every hour to take vitals. For otherwise healthy patients they take them four times a day, and never in the middle of the night...they let you SLEEP! Ben kept remarking how nice the room and the hospital were, "Way better than any hospital I've ever been to in Britan (and he is British!). Also they brought him a nice dinner and both of us a French breakfast of Cafe au Lait and Pain Chocolat. You've gotta love that! There's more to tell (about how I found out I couldn't leave Tunisia for five days after the surgery and had to hole up in a hotel and how kind the hotel manager was to me...and about how my wonderful foster daughter Zoe was the one who flew to Tunis to help me come home)...but all of that will have to wait for the next post. Reading it all back now even I think its a scary story for people like me who travel for work. I'm just glad it didn't happen somewhere where I don't speak the language. In Tunis I could follow what the doctors were saying and could question them when I didn't understand. When I finally called my Mom after the surgery she said, "Well honey, I used to think you were crazy for doing that Peace Corps thing but maybe you learned Moroccan for a reason"...and then she offered to get on a plane to come rescue me :-). Wow! I'm glad you are ok. Getting really sick in a foreign country in a hotel has always been one of my worst nightmares. I'm glad you had lots of very supportive collegues! Poor booboo! Quel ordeal, and hallelujah that it turned out well. Heal quick, and may the memory fade until it's only a good story. Hmm... you look at the odds and all the miles you fly and I think it's time you acknowledge what I've always thought - you are one lucky person!